When speaking with an office administrator or dental office owner about creating a paperless dental office, this is usually one of the first questions I ask. While there are still many dental offices that are not paperless, the concept of creating a paperless dental office is not new. In fact, there was actually an article posted in Business Week back in June 1975 about ‘offices of the future’ and how they would be paperless. But what does a “paperless dental office” really mean? It’s basically as simple as it sounds. A paperless dental office is one in which the use of paper is eliminated, or greatly reduced, by converting existing information contained on paper into a digital format. 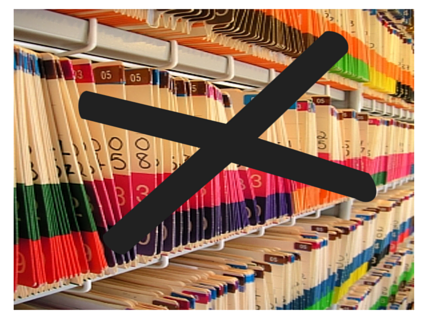 In dentistry, creating a paperless dental office is also referred to as going “chartless.” This is because there are actually still some instances where paper documents are still required. So while the majority of patient information including charts, images, and treatment plans are stored digitally – outside communication and information shared (incoming and outgoing) are still done on paper. Creating a paperless dental office is not something that can be done overnight; it will take some time to convert everything over. This is something to keep in mind when wanting to transition from where you are today to a paperless dental office of the future. Setting targets and taking the steps necessary to reach each milestone is a way to keep your expectations achievable. There is no need to do everything at once. Switching to digital charting, clinical notes, emailing patients their appointment reminders – these are all changes that can be made when converting to a paperless dental office. However, take it one step at a time as to not overwhelm yourself or your staff. Ensure your dental software provider is providing you with adequate training along the way, this way you are optimizing your dental software to best suit your new paperless dental office. Chances are, your practice is already somewhat a paperless dental office and you don’t even realize it! Take a moment and analyze exactly what your business process is. What are you storing digitally, and what processes are you still doing by hand on paper? Now re-evaluate your business process. Take a look at the processes that you are still using paper for and figure out if you can do them through your dental software instead. Not sure? No problem – simply contact your dental software provider and ask them if the software has any of these capabilities. If it can, great! Arrange some training and start taking the first steps to create your paperless dental office. If your software does not have the specific capabilities that you are looking for, it may be time to make a switch. For example, dental software provider, ADSTRA, offers a cloud-based solution that would likely meet and exceed your expectations for creating a paperless dental office. Now that you’ve sorted out WHAT you’re going to do with a paperless dental office, it’s time to figure out HOW to get you there. Dental software providers, such as ADSTRA, have solutions in place to help take the stress out of this step. Converting documents that come in, storing them electronically, and even sorting them by patient is a convenient solution to this step. Again, remember that this is a process – not an event. You will likely keep your old paper records and charts for a period of time while in transition to a paperless dental office. Having those on hand to refer back to will come in handy during this transition. Over time though, you will notice that you will refer back to them less and less, until the point where you won’t at all. This is when you can finally box the last of your charts and documents and truly utilize your paperless dental office.